Q. What was your favorite part about writing TOUGH JUSTICE? A. One of my favorite things was getting the chance to write something completely different from my other books that I write for Harlequin. I also enjoyed working with three other writers, Tyler Anne Snell, Gail Barrett and Carol Ericson. One of the best things was meeting some of the fellow authors and editors in New York City this past year. Q. What was the most difficult part about writing Tough Justice? A. Definitely the most difficult part was writing episode one. I knew I had to set up the story and the characters not only for the readers, but also for the authors who would follow me. I had to make sure I gave just enough information to whet the readers’ appetite, but also make sure I didn’t step on any toes or make things difficult for the next episodes. It had to be a careful balancing act. Writing the last episode was challenging as well. I knew I had to tie up loose ends and stay true to what the other authors had written. Still, the whole experience was a joy. Q. 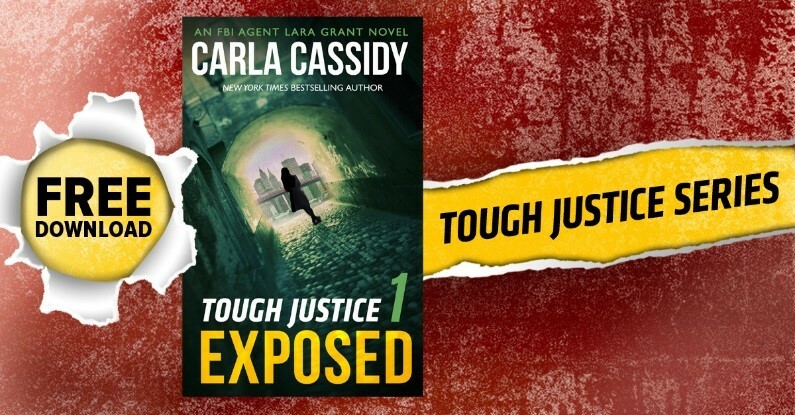 How does Tough Justice compare to your other books? A. I like to believe that all my books are character driven and in that respect, TOUGH JUSTICE was no different. TOUGH JUSTICE is definitely all about the intriguing characters. The other books I write for Harlequin are geared toward romance readers and TOUGH JUSTICE focuses more on the suspense. However, I believe both romance and suspense readers will find something here to enjoy! Q. What was your favorite scene? A. If I tell you then I’ll have to kill you. Seriously, I can’t specify a favorite scene without potentially giving away too much information about the story. We all hate spoilers, don’t we? Besides, the entire series is filled with scenes of danger, action, excitement and a wealth of deep emotion. Q. What do you love about writing suspense and crime? A. I love creating a chill that races up a reader’s spine. I love writing a scene that makes the reader feel a premonition of danger. It’s funny, I’m a light-hearted person who loves to make people laugh, but when I’m writing suspense novels I definitely tap into a dark side that is slightly uncomfortable and wonderfully fulfilling. I think much of my attraction to crime and suspense is because I also strive to understand what motivates people to break all the rules and to throw their very soul to the wind. Are killers made or born? Is it nature or nurture that creates twisted minds? I’m fascinated by people, both good and bad, but particularly the bad. I don’t want them in my life, but I sure love to write them! Q. What makes a perfect villain? A. A villain has to be three-dimensional. When I read a suspense book I want the villain to be more than just an evil entity on the page. I want him to have hopes and dreams. I want to see what emotional baggage he carries around with him. He has to be smart enough to be a real and present threat. Ultimately, he has to be a well-developed character who holds my interest. Moretti is the perfect villain for Lara and her team and I hope the readers enjoy the wild ride! About the author: Carla loves danger…but only when it comes in the pages of a book. She’s been a professional cheerleader, a singer and dancer, but the best job she’s ever had is writing books for readers to enjoy. She’s had over 140 books published and has enough ideas for new books to keep her busy for years to come. Visit her website at carlacassidybooks.com. This is very exciting series idea with different authors. I will check it out.